The second most ubiquitous piece of climbing gear is the carabiner. analogy of one carabiner to rule them all versus niche carabiners… like do you want something to work perfectly, or one thing to do most things well? As you read this guide, reflect if you’re the person who wants everything to work absolutely perfectly at all times, or if you favor efficiency and saving money over perfectness. Knowing these core terms will help clarify our recommendations. They’re not necessary to memorize, but we do casually use the terms _____, _____ and _____ from this point forward. Locking carabiners are required to belay, rappel, and when you tie into an anchor. Most climbers carry 1-4 locking carabiners on their harness. For indoor use, you only need one locking carabiner to use for belaying. For safety, you can also use locking carabiners anytime the carabiner is touching the rock in a way that it could rub the gate open and it would be tragic if the gate opened. Note: You can use a locker at any time when you want an additional level of safety. If you’re setting up a top rope anchor and have the time and means to use all locking carabiners, that is absolutely fine. It is not common to use lockers on quickdraws, but it is totally reasonable to use a locker for the first bolt, a low crux, a sketchy area, or a traverse that angles strangely. This is also part of the reason that climbing companies created products like the Edelrid Pure Slider, Grivel Twin Gate series, Kong Frog / Ergo / Panic and Mad Rock Trigger Wire. Since the operation is a manual screw, it may take longer to open/close than auto-lockers. Other than the expense and weight increases, the biggest argument against auto-locking carabiners is that they “turn climbers lazy.” The premise is that climbers will stop checking to make sure the gate is locked since it “always” seems to lock. Then when the auto-locker fails (perhaps it gets dirt in the mechanism) the climber isn’t checking. Or the climber forgets they’re useing a screw gate and no longer tests the gate to ensure it’s locked. Belay carabiner are always locking carabiners, whether they’re screw gate or auto-locking (see above). We’ll get into shapes details more below, but most often belay carabiners will be in a Pear or HMS shape. This gives the widest rope bearing surface and allows for the smoothest rappels. None of these are required, but if you want assistance narrowing down the choices, these are some features you could check for. A round top. This provides a smooth surface for the rope to roll over. The whole carabiner doesn’t need to be circular, but the more rounded the rope-bearing surface, the less friction there will be. Note: If the spine is an I-beam shape, it will be lighter weight. A belay loop keeper. The biggest danger of belay carabiners is their potential to become cross-loaded while belaying. This keeper ensure the carabiner will always be orientated in the strongest position. Note: Some climbers find this feature annoying, others find it worth the additional safety. Rotation Stopper. A mechanism or increase in size that keeps the belay device oriented in the best direction. Many of these devices were designed specifically to stop the rotation of belay devices like the GriGri. A bottom shape that suits the belay loop. It is rare to find this, but the more square-ish the bottom of the carabiner, the better it will sit in the belay loop. Most carabiner shapes come in locking or non-locking and wire or solid gates. Each carabiner excels in different areas; the most common wire/solid gate shape is Offset D. The most common locker shape for belaying is Pear/HMS. For other lockers it’s Offset D’s, to save weight. There are very few 3D carabiner models that don’t include a swivel attachment. The point of this 3D design is to increase the gate opening of locking carabiners and to reduce the chance that the rock will rub your rope and/or the locking gate open. Buy one if you’re the curious type and have money to burn. They’re not cheap, and there’s not many in the US. Not usually used directly for climbing. Most often used on chest harnesses and rope clamps. They balance the load equally, and they’re always locking. Buy if you need to secure a chest harness (where you would end up cross-loading any “normal” shaped carabiner). This is not a common piece of gear to own. The only reason we list it in the carabiner section is because the UIAA certifies it as a carabiner. It’s made of stainless steel and closes (securely) with a wrench. It’s ideal for fixed draws or rappel stations. Buy if you want to make some fixed draws, or connect a bunch of crappy slings together to have a safer point to rappel from. This would also make the rappel so you’re not rubbing rope on rope (similar to the goal of a rappel ring, except this mallion is easier to add after the fact). Note: Non-Climbing brands make these types of links as well, if you’re buying from a non-climbing brand, ensure it is certified EN12275. You’ll notice each carabiners cross section is also very different. In the last 5 years, the amount of completely round-stock carabiners has dropped drastically. 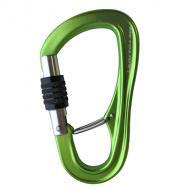 Now, most carabiners now have at least slight cut-outs to reduce weight, and also to create more eye-catching designs. The biggest reason for I-beam designs with shapely cut-outs is to save weight. Sometimes this means the strength will decrease as there is literally less metal. Other times, the strength will be nearly equal thanks to smart engineering deciding which area’s of metal can be removed without reducing strength. Manufactures spend a lot of time designing for the “best” strength to weight ratios. The only time it is particularly beneficial to have a round (or more round) carabiner, is while belaying and rappelling. The wider and rounder the top of the carabiner is, the less friction the ropes will have. Since I-beams are more complicated to make, they also cost more. So generally the balance is around weight, price and strength. The most intricate carabiners are made via a hot forging process, which involves heating the metal to make it more malleable. This heating process is time consuming and requires more machinery so it is also usually a more expensive process. But, it can also be the only process that can create such elaborate carabiner shapes. Traditionally, carabiners were made via cold-forging which requires a machine for bending and then stamped into a mold to form the exact shape. Often this carabiner is still heat treated to strengthen the structure, but not to the degree that the aluminum is heated for hot-forging. Click to see an [old] video from Black Diamond that demonstrates the cold forging process. The size of carabiners varies dramatically as well. Generally size is thought of as “full size” or “mini” and now even “micro.” Unfortunately there is no official definition of a “full size” carabiner and the other names aren’t official either. This is an example of two carabiners that are almost identical in shape but vary in the size. These carabiners, the CAMP Nano 22 and Photon, are proportionally correct but will probably not display as the actual size on your device. Just because a carabiner is bigger, does not always mean it will be small either. Here is an example of the lightest carabiners and how much their size can differ. The only carabiner in this photo that is considered full size is the CAMP Photon. There is no size that will fit every climber best. To find the size that works best takes experimentation. The fastest way to find the best size is to try out as many carabiners as you can from different brands. See how they fit in your hand. The size of the carabiner may change your clipping techniques. For example, the smallest carabiners will only allow one finger on the gate to open, while many larger carabiners will allow two. Most climbers will notice they have to handle mini/micro carabiners in a fairly specific way. One question is, how intuitive is that handling for you? When you grab this carabiner off your harness, will you be able to grab it in the correct position every time? If you don’t grab it in the correct position, will it be annoying? There will be a larger learning curve to get used to small carabiners, versus ones on the medium/large side. And, even with practice, some climbers can’t stand the mini/micro carabiners. That’s fine. It’s all personal preference. Top rope climbers main use for more carabiners is for setting up anchors. You’ll want a carabiner that is small enough to fit through bolts and chains but large enough that it’s easy to use and has less potential of dropping. Most sport climbers pick full size carabiners because their priority is easy clipping. You don’t have a lot of gear on your harness so the weight doesn’t matter as much. Trad climbers who have a lot of gear on their harness may like smaller carabiners, particularly for <<<<<racking their cams and nuts>>>>> because they take up less room and weight. If you sport and trad climb and want to save money as you switch between disciplines, you could buy smaller carabiners for racking your gear and larger carabiners for your quickdraws. Alpine climbers may prefer smaller carabiners to save weight on long approaches. Ice Climbers are in the trickiest spot, because they need to carefully balance how easy a carabiner is to clip with gloves and how much weight is added. All locking carabiners have straight gates. Non-locking carabiners (both wire and solid gates) can have straight or bent gates. There’s no price, weight, or strength difference between straight and bent gates. Both types may come with a keylock nose. *Bent gate carabiners main use is for the bottom of the quickdraw because it makes clipping the rope easier. It’s also nice to have a bent gate to distinguish the rope-end of the quickdraw. This is important because the top carabiner that touches bolts may get micro-cuts/burrs in the metal (enhanced by falls) that can have surprisingly dangerous results (http://goo.gl/6tpVw) of cutting the rope. It’s important to be consistant in which carabiner is used for protection and rope side of the quickdraw. **Usually the quickdraw dogbone (material connecting the carabiners) is fixed in place (by tigher sewing or a rubber stopper) on the rope-end. If the fixed side is used on the bolt (and not the rope), and the quickdraw is loaded, the sling could contort the carabiner and result in cross-loaded forces. Who benefits from racking carabiners? Trad climbers, ice climbers, alpine climbers, basically any climber that is taking a “rack” of gear with them. In addition to coming in every color, racking carabiners also come in all shapes and sizes. Why rack with colored carabiners? Keylock Benefit: The lack of a hooked nose means there is significantly less snagging on other gear or bolts – a dramatic improvement. Keylock Drawback: Given that they’re more complicated to manufacture, keylock designs often come at a higher price. A keylock nose itself does not ensure snag-free clipping. The severity of the nose angle has a significant impact on whether it will catch, particularly while clipping bolts. The more continuous and smooth the curve of the basket-to-nose interface, the less catching and ultimately the easier the carabiner is to clip and unclip. The smoother the curve and flatter the arc, the lower the snag potential. The larger the gate opening the more rope/webbing/gear you can clip into it. It is also associated with easier clipping. Although it’s tempting to assume that a large gate opening is better, gate opening alone does not guarantee a superior carabiner. A larger gate opening signifies the potential for the carabiner to be easier to clip and hold a lot of gear, but this could easily be thwarted by the angle of the nose, the width of the basket, or the usability of the gate (i.e. ease to hold open, how your finger(s) fit). What is the best gate opening? Good question. It’s impossible to choose the best carabiner based on gate opening only. The answer will change depending on how you’ll use the carabiner. What matters most is how many items (and the size of items) you want to easily fit into the carabiner. You can see graphs and more geeky data on our post that covers weight vs gate openings. The combination of gate opening and basket size are the two most significant factors when determining how much gear you can effectively get into a carabiner. The relationship between basket size and gate opening also impact the technique required to clip the carabiner. If the basket and gate opening are too small, it may not be possible to clip with a full finger(s) in the basket because your fingers will get in the way of the rope sliding into the carabiner. Gate opening is less important than how the carabiner feels in your hand and how you can operate the carabiner in a clipping situation. This is because the body shape, nose design, and shape of the basket can completely change the feel and usability. That being said, you will want a larger gate opening if you want to use the carabiner to hold lots of webbing or rope, such as in an anchor situation. For anchors, a small gate opening can slow you down and become a source of intense frustration if your systems aren’t highly refined. Clearance is king. Adding bias towards a larger gate opening is a fantastic option once you’ve narrowed down your choice to a few similar carabiners and need to determine which one is the best. To ensure your new carabiner is strong enough to use rock climbing, make sure it is CE and/or UIAA certified from a known climbing manufacturer. That’s literally all you have to do to ensure your carabiner is strong enough to climb on. Offset D’s strike the best balance between gate opening, weight and strength. This is quite a stark contrast compared the traditional shapes, like ovals, that are weaker and have a smaller gate opening. Get more details of all the other shapes and see graphs in this Strength to Weight Carabiner Post. 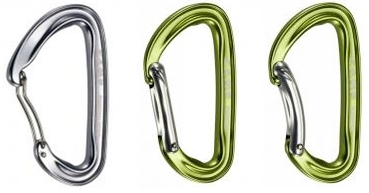 Carabiner weight varies from 19g to over 100g (the latter being steel). Wiregate carabiners range from 19g to about 50g and are by far the lightest available. Solid gate carabiners are the next lightest and range from 31g to about 80g. Lockers are even heavier, ranging from $7.50 to $26. It’s worth noting that screw gate lockers are significantly lighter than auto-locking carabiners. The price of carabiners varies dramatically. Generally, the lower the price the heavier the carabiner (excluding steel, which is much heavier and much more expensive). Nice to have options like keylock carabiners are also more expensive. Lockers are also pricier than non-locking. can get every shape/size/gate type, but lighter! Soak and scrub/brush the carabiner in hot soapy water. For a thorough job, you can burst some compressed air in the holes to remove any remaining particles. Or you can wait for it to dry, which will take at least an hour. Lubricate the gate/rivet/spring/lock area, making sure to wipe off any excessive lube.